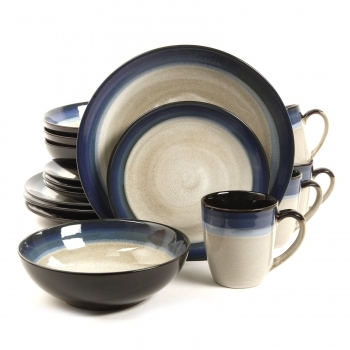 The Gibson Elite Couture Bands 16 Piece Dinnerware Set is a distinct and striking blend of form and function. This durable and elegant stoneware comes in a variety of gorgeous reactive glaze patterns with cream centers and Blue, Brown, or Red Reactive glaze rims. Take your next dining occasion to a higher level of sophistication and beauty with these wonderful and eye-catching pieces. Each set comes complete with 4-each of stunning dinner plates, salad plates, bowls and deep mugs.